The OverDrive has had a branding facelift for 2018, now dubbed the M1 after its full racing cousin, the Mach1. In this size it has the same dimensions as its 2017 predecessor, yet dispenses with the Reflex batten system of old, in favour of an ‘automated dynamic twist’. By “pre-loading” the lower leech, Severne believe they have been able to replicate the twist pattern of the Reflex batten system, yet by its omission have improved durability and tuning ease as well as cut down weight. Interestingly, they have also looked at the foot panels of the M1, reducing the tension in the trailing edge leading up to the clew, so that whilst the draft of the sail remains locked forward, the foot panel can “twist and auto-adjust” to the flow of air of its surfaces. Novel stuff! Like its predecessor, the M1 uses monofilm extensively throughout its panels, the brand quick to extol the material’s virtues when others are looking the other way. It also offers two clew eyelet positions – an integrated pulley for an adjustable outhaul system (which is recommended for most) and a lower position for lighter riders seeking more control in strong winds. 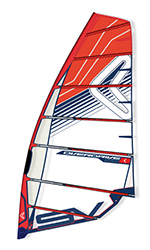 The sail’s skin tension is also said to have been increased, using the attributes of their quality Apex Pro mast to increase the luff curve and lock the sail’s profile low and forward. With Spiderfibre incorporated on the trailing edge to increase its exo-skeletal strength and seamless panels in the head and foot, the OverDrive M1 benefits from Severne’s carefully considered attention to detail and really looks the part. Last year we referenced just how light in the hands the OverDrive R8 felt and we have to say the M1 picks up where its forerunner left off. It is incredibly easy and balanced in the hands at rest, the power delivery subtle and progressive, rather than forceful or overbearing. It requires more of a gentle approach in marginal winds, the short boom length making the sail feel more akin to a 7.0m than 7.8m. That said, the luff curve remains one of the least in the group, enabling the mast to flex under pumping and generate some additional drive. It’s a tall looking sail, and promotes a more upright stance in light to comfortably powered winds, making the most of its whole sail area. Requiring little commitment from the rider to sail well, it is fast on all points of sail, the forward placed centre of effort taking all the strain out of long periods on the water and translating any extra pressure from gusts into instant acceleration. 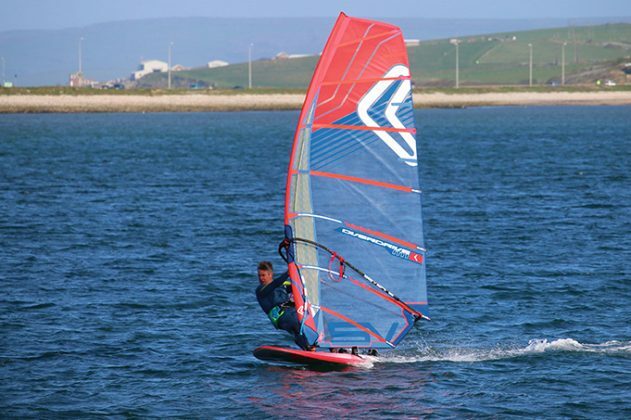 It is just such an easy sail to get on with – a feature even more prominent in transition as the light handling and smooth cam rotation can’t help but inspire the rider to enter with more speed each time. Our only niggle last year was with the OverDrive’s top end composure, as we experienced the stability waning sooner than some. Rigged on their high-quality Apex 460cm, the M1 seems to have more top end stability, the sail twisting smoothly throughout its leech, helping to keep the draft locked forward. With better range than ever, the OverDrive retains its most desirable feature – wonderfully light balanced handling. Easy to rig, set and get along with, the energy and technique required to use the OverDrive is minimal, leaving the rider to concentrate on their own performance and that of the board.